Hard money commercial loans are a lending tool that many businesses overlook when they need financing. While they are not part of the mainstream lending market, they could be a viable option for your business when you need money. Here are the basics of hard money commercial loans and how they work. Hard money loans are provided by private investors. These hard money lenders wish to loan out their money at a higher interest rate than they could get from another type of investment. Hard money lenders are typically only licensed to loan in a certain geographic area. When you apply for a hard money loan, the application process is going to be quite a bit different than what you are used to with a bank. You will have to fill out a form with basic information about you and your business. However, they use their own criteria when deciding whether or not to invest in your project. They may or may not use all of the financial ratios that typical lenders use. The approval process is usually very quick. You often do not have to go through multiple layers of the business to get approval. The lender decides individually if they want to give you the loan. Often the most important criteria for the loan is the condition of the property that you are buying. If you are buying a piece of commercial property, the lender will want to know everything about it. They will want to look at the property and make sure that they could resell it if they needed to. Because of this fact, they will often offer you a low loan-to-value ratio as compared to other lenders. This way, they ensure that they can get their money back out of the loan if you were to default. Fast approval- Many times you will have an answer on whether you are approved for the loan within a few days. It does not have to undergo a complicated underwriting process like it would with a normal lender. This gets you the money that you need much quicker. Flexible terms- Most of the time, with a hard money loan, you can get very flexible terms to work with. For example, a very common term with hard money loans allows you to pay only the interest on the loan for a few years. Then at the end of the loan, you make a balloon payment to pay off the loan. 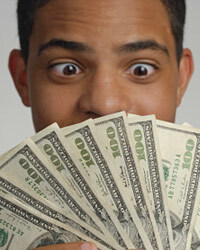 Bad credit is alright- Hard money lenders make a business out of lending to those with bad credit or no credit. If other lenders do not want to work with you, hard money lenders may. Although hard money lenders can be very beneficial in certain situations, there are a few things that you will want to watch out for. For example, the interest rates can be very high. In addition to high interest, they are usually short-term loans that will require refinancing at some point to pay off.